You can escape your boring 9 to 5 job in 6 months or less! How many times have you felt like quitting your monotonous day job? Have you ever felt that you should be following your heart and doing something better? Are you yearning for the freedom to do what you want, when you want and from wherever you want? Then, why are you still working for somebody else? The answer is simple. You are scared of the consequences of quitting your job. You are worried about your financial security. You are not sure if your business idea would work. Most entrepreneurs would advise you to just leave your job and start your dream venture. Wish life was that simple! But this book would advise you to reverse the equation. Why quit your job and then start your business? 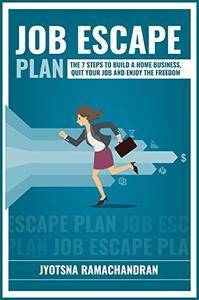 Instead, this book suggests you to first start your home-based business, generate a steady passive income from it and then comfortably quit your job. Doesn't that sound more doable? Job Escape Plan is your ultimate 7 Step guide to quit the rat race! Includes the interviews and success strategies of top online business owners like Andy Dew, Alex Genadinik, John Lee Dumas, Nick Loper, Rob Cubbon, Steve Scott and Stefan Pylarinos!